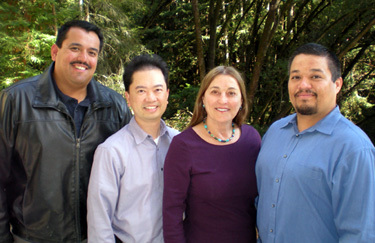 Leading the project to create teacher education programs in teaching English and grade level content are, from left, Jorge Solis, Joe Chee, Trish Stoddart, and Eduardo Mosqueda. Education researchers at UC Santa Cruz have received nearly $2 million over five years from the U.S. Department of Education to develop methods of training prospective elementary school teachers how to best teach English to English learners while also teaching grade-level content. Led by UCSC Professor of Education Trish Stoddart, the English Language and Literacy Integration in Subject Areas (ELLISA) project will be implemented and evaluated in teacher preparation programs at San Francisco and San Jose state universities. The project is based on using effective teaching practices that integrate the teaching of English language and literacy development with the teaching of science, mathematics, and social studies. A critical issue facing education in the 21st century is to prepare teachers to work with the rapidly increasing population of students with limited English proficiency. The National Education Association projects that by 2025 one in four students in the U.S. will come from homes where a language other than English is spoken. Today, California public schools educate more than one-third of the nation’s English learners. The education of English learners is complex because it involves teaching academic language and literacy to students while also teaching grade-level content such as science, math and social studies. Studies have shown that English learners can quickly fall behind native speakers in acquiring academic knowledge and language skills. The $1.97 million grant comes from the Department of Education's Office of English Language Acquisition National Professional Development Program. Stoddart is an expert at improving the teaching of science in culturally and linguistically diverse classrooms and has extensive experience in research on instructional innovation and science education. Previously she led two National Science Foundation funded projects -- including Effective Science Teaching for English Language Learners (ESTELL) that focused on preparing novice teachers to work with English learners, and Language Acquisition through Science Education for Rural Schools (LASERS) that brought together seven school districts to improve the teaching of science to English learners in the Central Valley. Joining Stoddart is Eduardo Mosqueda, UCSC assistant professor of education, Jorge Solis, a post-doctoral researcher, and Joe Chee, a graduate student researcher in the Education Ph.D. program. They will conduct research and evaluation in collaboration with Stoddart. Mosqueda conducted a national study of English Learner achievement at Harvard University. His research showed that access to rigorous content for English learners was significantly improved by the provision of English language development support. “Our goal is to directly redress the chronic underachievement of English learners in content area courses to better prepare them for undergraduate degrees and careers in STEM,” Mosqueda said. The ELLISA consortium includes education departments at San Francisco state and San Jose state universities and two partner school districts in San Jose -- Alum Rock Union Elementary and Franklin-McKinley, both of which serve large populations of English learners. Competition in the 2011 National Professional Development Program was intense with only 42 grant proposals recommended for funding out of 262 applications submitted.